This shop is part of a social shopper marketing insight campaign with Pollinate Media Group™ and Home Depot & Rubbermaid, but all my opinions are my own. 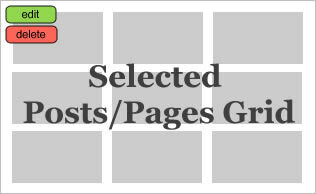 #pmedia #AllAccessOrganizers https://cmp.ly/3/8vNxcO. It is pretty much a guarantee that if you have kids you have toys and if you are like most families I know, the toys are ruling the house. They are everywhere and always in use. It can be hard to figure out how to organize toys because they come is odd shapes and sizes. 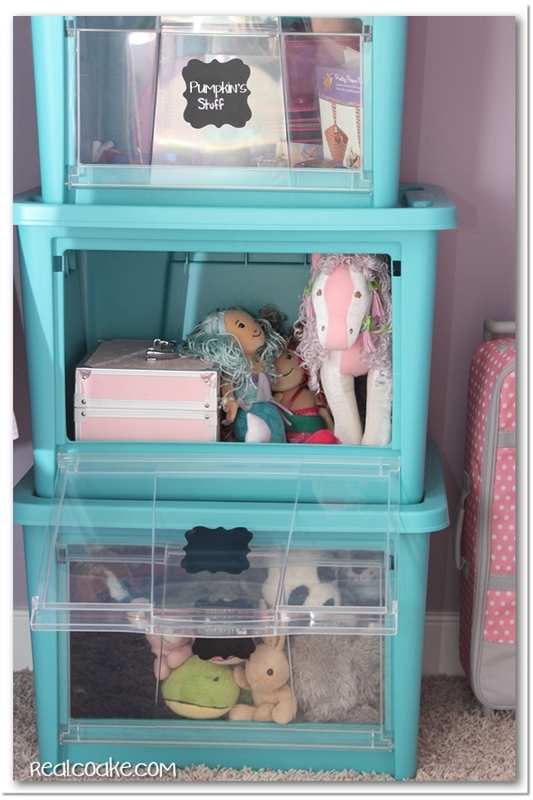 I've got some ideas for you for toy storage. Hopefully, you can get a few new ideas today that will help you in your own home. We have this odd corner of our 3rd bedroom. When we turned this room into our playroom, I had thought that this corner was going to be great for play and storage. It has mostly turned into a dark corner with too much stuff. My daughter's and I were walking through Home Depot one day looking for organizing bins for another project. 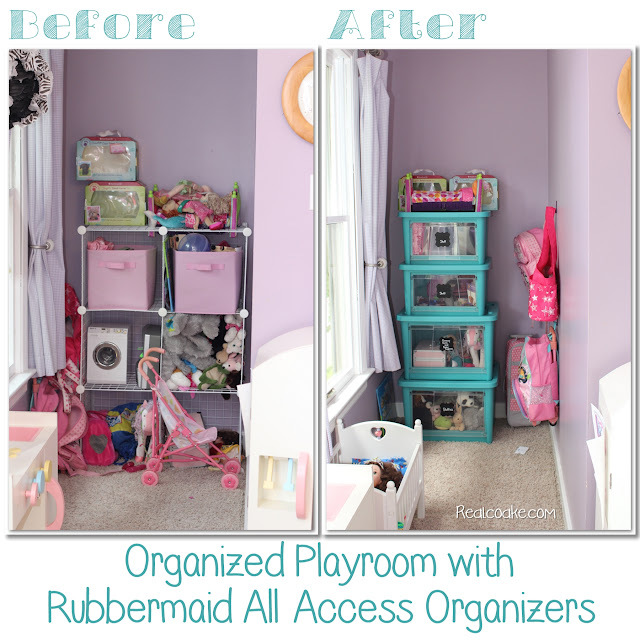 We saw the Rubbermaid All Access Organizers and all really loved them. We loved how you could stack the bins but still be able to get to everything with the neat clear drop down doors. We all had the same thought of using them in the playroom, but it wasn't in the budget or in the plans for that trip. A short time later the opportunity to work with Rubbermaid for a post here on the blog that featured the All Access Organizers came up and you guessed it….my family and I jumped at the chance. 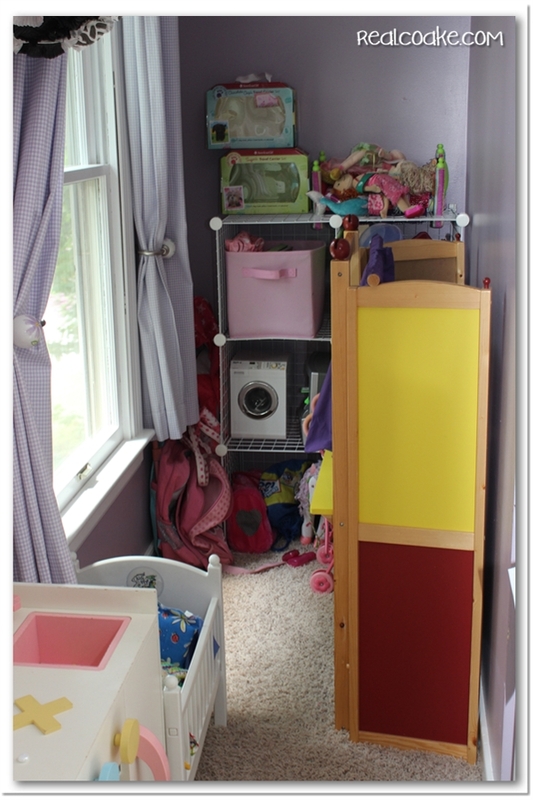 Here is our playroom corner before. As you can see we had a puppet theatre in this area, a play baby crib, the wire shelving and a bunch of bags shoved up next to the shelving. It worked, but it was a bit messy and the wire shelving never really did a great job of holding things without some things falling through. First, we relocated the puppet theatre to another location to make the space more open. Then it was time to take everything out of the area, sort and purge a few things. Now the fun part! We bought two large and two small Rubbermaid All Access Organizers at Home Depot. They were a bigger than I thought they were going to be, which really worked perfectly in our space. We stacked the 4 bins but even though they are stacked, the girls will still be able to access everything through the clear drop-down doors. The top two bins are one each for each of my girls to have some space to store things that are theirs and not for joint use. The other bins hold toys and stuffed animals. 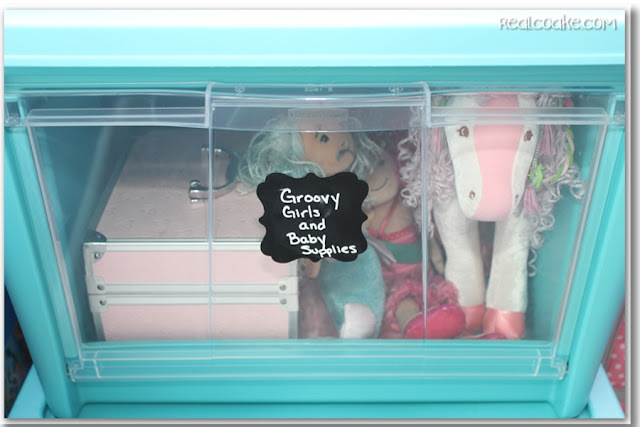 I added the same chalkboard labels for organized toy storage and a cohesive look to the playroom. It is so nice to be able to easily see what is in the bins. Easy to get to what is inside from the front. One of the things we like about the bins is the ease of accessing the things stored in them. 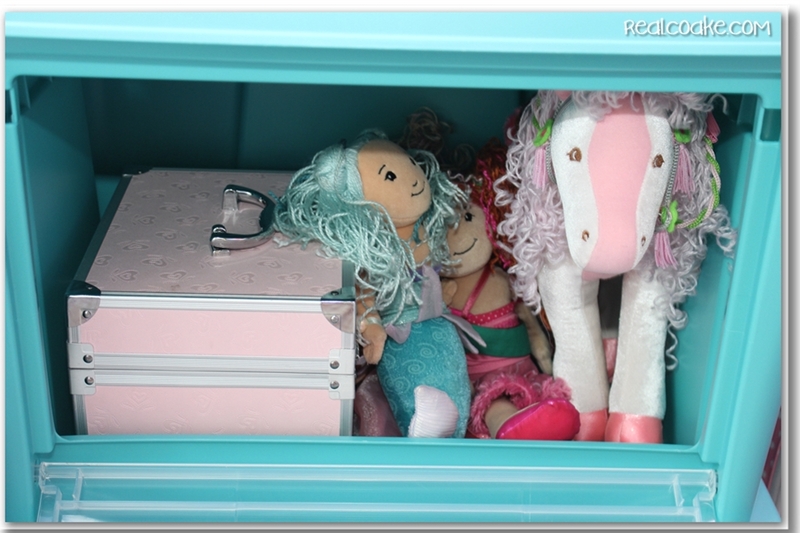 For example, Snowflake has a bank in her bin (the top bin in our stack of 4) that won't quite fit through the door, but that isn't a problem because these bins also allow access through the top like traditional storage bins. So, she can just get her bank out from the top. To finish out our new playroom corner, I used adhesive wall hooks to give the bags a place to be put away rather than shoved in the corner. I love having bags up off the floor, it just seems to make a big difference to me. 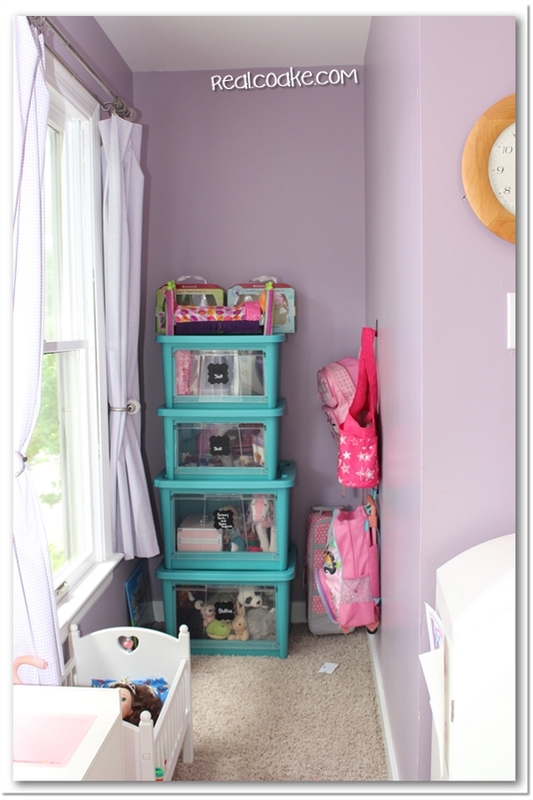 We couldn't be happier with our little playroom corner makeover, it sure lightened the area up and made it a lot easier to get to everything we had stored in the corner. Some day when we don't need these bins for our playroom, I think they would work great for storage in our attic or shed, easy to get things in through the top and out through the clear drop-down doors. You can find Home Depot and Rubbermaid on Facebook as well for more ideas. What ideas do you have for the Rubbermaid All Access Organizers? It seems like they could be used so many different ways. This would have been so much better than the toy chest we had for our kids that things would fall to the bottom and then they’d have to pull it all out to get to it. But even now that they are older, I could see uses for these! Yes, this would be better than a toy chest. I can only imagine that every toy would be flung across the room with a toy chest. Probably daily or multiple times a day. Yes, I think these bins would work so well for older kids as well. They can see what they have stored in each one and easily get to things. My girls are getting out of the toy stage but that doesn’t mean they’re not out of the “stuff” phase!! LOL! Love the clear front so they can see what “stuff” they’ve tossed in there!! Yeah, out of the toy stage doesn’t mean out of the stuff stage. There will always be things to store. Maybe you would have less, “Mom where did I put X?” with these bins. I love those totes! I could totally redo my laundry closet disaster zone with those. I almost used them in my laundry room as well. I think they would work so well to help organize the laundry room. 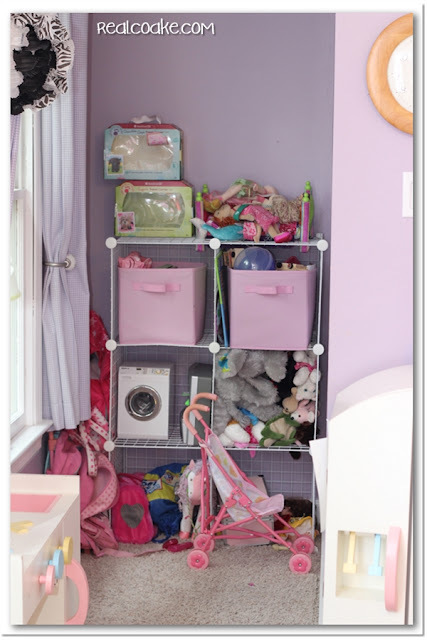 Storage that is easily accessible. Good luck with your laundry closet. These bins are a life saver!! I love the look of stuff from Vera or Thirty One, but that crap is EXPENSIVE! Rubbermaid is cute and doesn’t break the bank! Sign me up! Yes, you are right! It is cute and it works for my budget as well. Great combo! These look great! And so helpful for organization! Thanks, Ilene! They sure are. I bet they would help you with your move. It would make it easy to find things when you arrive and are getting things set up. Nice transformation!!! Love the color of the bins and that the fronts are clear! Thank you! Yeah, we thought the colors were lots of fun as well and the clear fronts are a lifesaver! Have a great night. Nice! I’ll have to look into those! Thanks, Gena! 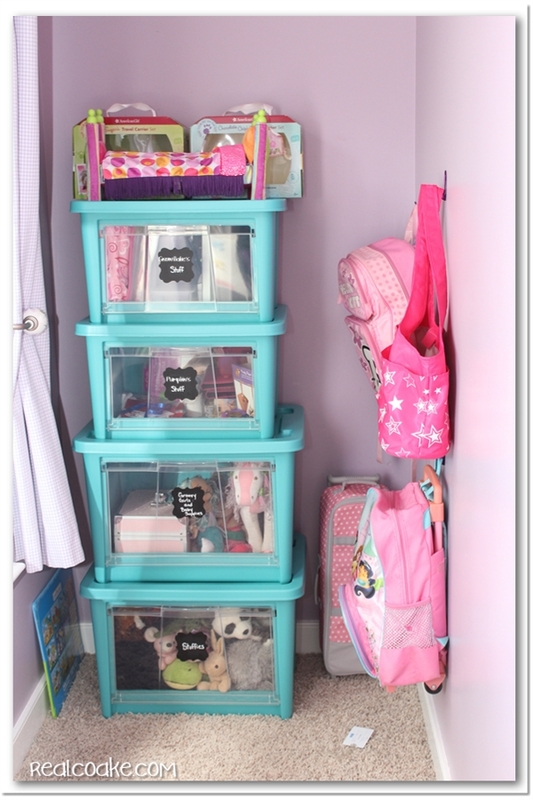 They are great to organize with and easy for the kids to use. Perfect combo. Keeping toys organized can be SO hard but, those Rubbermaid bins look perfect for the job! Thanks for linking up to Thrifty Thursday! seriously it seems like you turn around and the toys are out of control again! love those bins!